1. Get a Bittrex user account. 2. Transfer some bitcoin to Bittrex. If you don’t have any bitcoin, Coinbase is a good place to buy some. Transfer your Bitcoin from Coinbase to Bittrex. 3. Download and Install the latest version of the TREX Application. 4. Run the TREX application. After accepting the terms and conditions, you will be able to connect TREX to Bittrex and to this Site. Providing your country of residence will determine the real world currency TREX uses to describe digital currency values for display purposes. On initially creating your account please set this value correctly for bandwagonhunter.com accounting requirements. After that you can set this to any country (currency) you wish. The Email address you use does not have to be the same one you use for your Bittrex account. You will need to verify your email address by clicking a verification link in an email sent to the address you enter. You can manage your Keys and Secrets here. Note: This data is financially sensitive to you, TREX will encrypt and store this data locally, so that you only have to get these values once. DO NOT STORE THESE UNENCRYPTED VALUES! 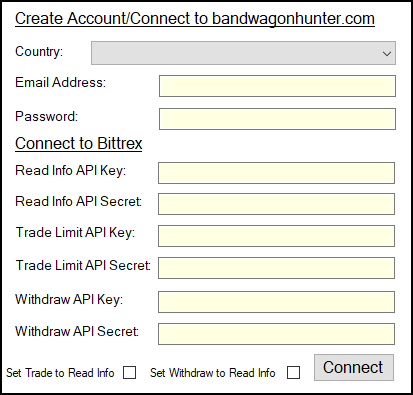 TREX will never send your Bittrex data to bandwagonhunter.com. After confirming your email address is valid by clicking the link in the email sent by bandwagonhunter.com, TREX will prompt you to make a software payment before being allowed to proceed. You have to make one payment every 7 days to keep TREX enabled (payment size can be viewed at the bottom of this page, also note that "Automatic Trading" may incur additional, transparent payments.) TREX will then prompt you to see if you want to run the wizard: the wizard groups currencies by their market sizes and configures the groups to match, it is important you re-run the wizard periodically to update the groups based on new data on market capitalisations. To rerun the wizard you must get new keys from Bittrex, then delete your configuration file using the TREX login screen. This is effectively a fresh start although your account including your password and data on bandwagonhunter.com will remain unchanged. If you already have a variety of digital currencies on Bittrex then you can use the wizard to configure TREX quickly. 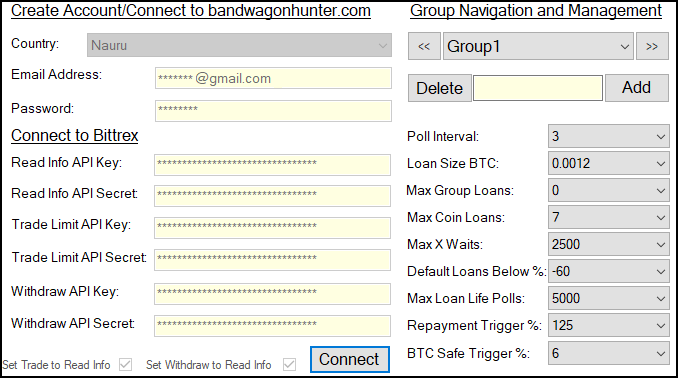 TREX groups your currencies and stores this configuration along with your encrypted Bittrex data. If you do not already have currency, just create a group. Add some currencies and then use the Redistribute tool to buy into those currencies using the bitcoin you bought on Coinbase and transferred. Once done you will be able to configure your groups as you want. Managing and Navigating Groups: Here you can add groups, delete groups and select which group to view. You can also control how a group works while "Automatic Trading" using the values provided. Please note: the more loans you allow TREX to do, the longer you may have to wait for losses to turn into profits. You can hover over these items while using TREX to find out more about the effect they can have on TREX performance. 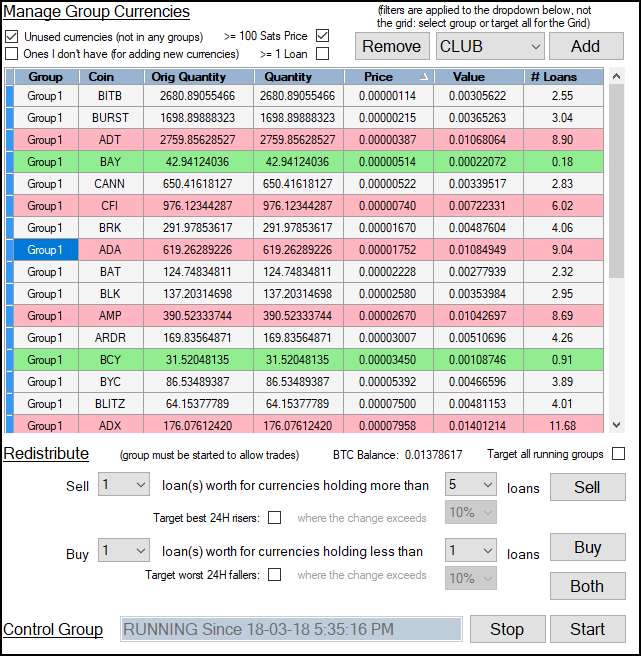 Managing Group Currencies: This grid will only show the currencies for the selected group unless you select "Target all running groups" (doing this will also affect all sells and buys when batch trading.) You can add and remove currencies using the filters and controls above the grid. Control Group: Only "Running" groups will be used while TREX is in "Automatic Trading" mode. When selling you are selling to bitcoin, when buying you are buying from bitcoin. From version 1.1 there are extra checkboxes so you can use TUSD instead of bitcoin to buy from and sell to. Every time you start TREX, it tries to start in "Automatic Trading" mode. If it fails to initialise, it takes you to the screens above so you can resolve the issue (e.g. you may not have enough Bitcoin in your BTC wallet on Bittrex, so you need to do some sells.) If you try to close the application while in Configuration/Batch Trading mode, TREX will let you know if it will not be able to start in "Automatic Trading" mode and allow you to resolve the issue(s) before closing. After starting TREX in "Automatic Trading" mode you will have around one minute to change mode, after that time the only way to stop the "Automatic Trading" session is to close TREX. Click here to see an example short session of TREX in "Automatic Trading" mode. WARNING DIGITAL CURRENCY IS HIGH RISK: If you are the type of person who is uncomfortable with risk, you have probably come to the wrong place. Perhaps you should put your money in the bank and make a guaranteed annual interest rate, or maybe government bonds. To everyone else don't put more in than you can afford to lose if prices collapse. And remember the higher you set Max Group Loans to; the higher the risk you are taking in the hope of higher profits.